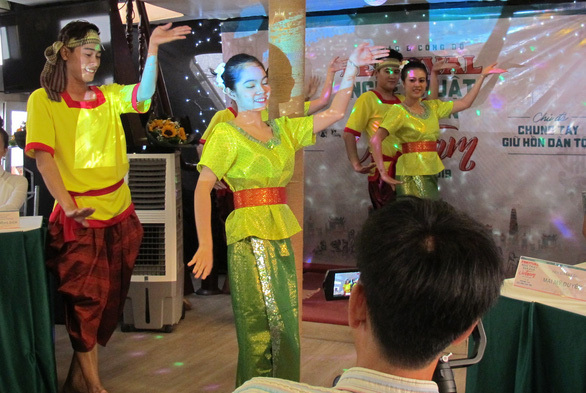 People in Ho Chi Minh City will be treated to spectacular folk performances from across Vietnam during a special three-day program in celebration of the country’s annual Hung Kings' Festival. The festival is a public holiday annually observed on the tenth day of the third lunar month to honor Hung Kings, Vietnam’s legendary founding fathers. This year’s holiday falls on April 14. On this occasion, the inaugural Vietnam Folk Arts Festival will take place on Nguyen Hue Pedestrian Street in District 1, Ho Chi Minh City from Friday to Sunday, promising a lineup of performances set to wow tourists and local citizens with diverse folk performances from different regions in Vietnam. “Nguyen Hue Pedestrian Street is an ideal place to capture the attention of both Vietnamese and foreigners," Vuong Duy Bien, former Deputy Minister of Culture, Sports and Tourism, said at a conference on Monday, adding that the performances will highlight the distinct cultures of many of Vietnam’s 54 ethnic groups. The shows will take place from 4:00 pm to 10:00 pm on Friday and Saturday, and from 8:00 am to 10:00 pm on Sunday. Hong Diem, a spokesman for the event’s organizers, shared that the festival is focused on promoting national folk art to the public, especially children. “Children today spend too much time on technical devices instead of taking part in traditional activities and we want to put an end to this," said Diem. If the inaugural festival proves to be a success, it may become an annual event in the future, according to the organizers.